Leedale Cottage in Saltmarshe, near Howden sleeps 6 people. Situated in a riverside location and on part of a working livestock farm nestling in a beautiful rural setting, this former barn has been creatively converted to offer charm, character and spacious holiday accommodation. Spend some time around the animals or take a walk along the banks of the River Ouse. Diggerland, Magna Science Adventure Centre including Sci-tek and Aqua-tek, The Deep Aquarium, Eureka the National Children’s Museum and Waterworld are just a few of the family days out on offer, all in a radius of 30 miles. Lunch in York while visiting York Minster and take an evening ghost walk after a meal in one of the many restaurants. Shop and restaurant 4 miles. All on ground floor: Living/dining room/kitchen with double sofa bed, beams and laminate floor. 2 bedrooms: 1 double, 1 twin. Bathroom with bath, shower cubicle and toilet. Bio mass central heating, electric, bed linen and towels included. Travel cot. High-chair. Freeview TV. DVD and small library. CD. Electric cooker. Microwave. Shared laundry room with w/machine. Dish washer. Shared patio. Garden furniture. 12-acres of shared natural, unspoilt woodland. Ample parking. No smoking. Easy walking access. NB: Fenced river in grounds, 50 yards. Holidays at Leedale Cottage run from Saturday to Saturday. For a better idea of where Bank House Farm - Leedale Cottage is, you can see Bank House Farm - Leedale Cottage on the map below. 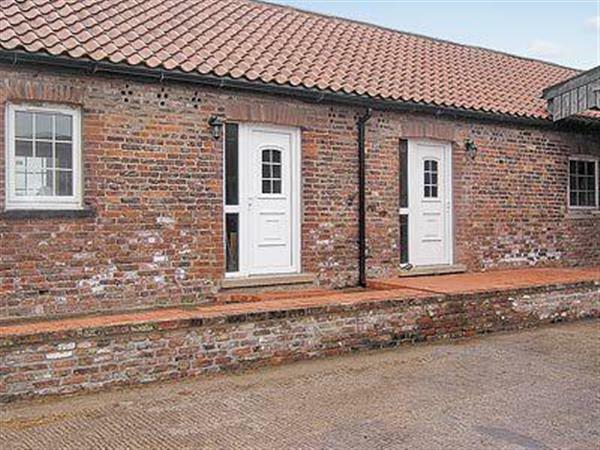 Bank House Farm - Leedale Cottage is in North Humberside; should you be on the lookout for a special offer, you can find all the special offers in North Humberside. It's always worth checking to see what is on offer at the moment. Do you want to holiday near Bank House Farm - Leedale Cottage (W42613), you can see other cottages within 25 miles of Bank House Farm - Leedale Cottage; have a look to find your perfect holiday location.